Could there be a more heart-wrenching story for mothers? What faith these women had! In the year 203 in the North African city of Carthage, Roman culture dictated that all good citizens of the Roman world should honor the pagan gods of the Roman world. The way the Romans saw it, all good Romans just naturally worshipped their Emperor’s gods, just as good citizens paid taxes and obeyed the laws. They did not understand that Christians, because they believed in Jesus Christ, could not honor any gods but the One True God. Whenever people make a choice that leads in a different direction from the majority, this can cause misunderstanding and fear. The Romans felt that because the Christians refused to worship Roman gods, the Christians were traitors to Roman society. Because of this, the Roman Emperor decreed that it was against the law to become Christian under pain of death. In spite of this law, many good people who heard the Word of God and believed in the One True God were not afraid to join the Christian Faith anyway, knowing that God would protect them in spite of everything. At this time, a high-spirited young woman named Perpetua lived in Carthage. Her husband had just died, leaving her with a new baby to care for. She went back home to live with her mother, who had secretly become a Christian, and her father, who was still a pagan. When she heard the Good News from her mother—the Gospel stories about the life and teachings of Jesus—her heart led her to answer His call to become a Christian. After Perpetua was baptized and embraced the Faith, she invited her brother, her maid Felicity, and her maid’s husband to learn about Jesus and discover the wonderful Love of God. When they went with her to the secret meeting of the Christians, the Roman soldiers came and arrested them all. All of them, along with the teacher who was teaching them about Jesus, were thrown into a dark, crowded, hot dungeon. The conditions were so horrible that the teacher died there in prison. Perpetua was allowed to keep her baby with her in prison, but, because her father was so worried and upset that he could not convince Perpetua, in spite of pleadings or beatings, to change her mind and worship the Roman gods, he took her baby away from her. Perpetua suffered deeply because she was separated from her baby, but she knew that her mother and father would care for her child. Felicity, her maid, suffered even more because she was arrested just before it was time for her to give birth to her first child. She went into labor and had her baby in prison, without any comforts of home. Soon afterward, her baby was taken away, too, and raised by a holy Christian woman. On March 7, a day of great feasting because it was the Emperor’s birthday, both Perpetua and Felicity were taken into the arena as part of the “entertainment,” while thousands of Carthaginians watched a mad cow attack them. Perpetua’s brother and Felicity’s husband were attacked by an angry leopard. Even though they were badly beaten by this ordeal, the Christians remained courageous and faithful to their beliefs, refusing to worship pagan gods or wear robes that honored the Roman gods. They did not die as a result of their tortures and beatings, so the Roman soldiers came into the arena (after the animals were taken away) and killed them with their swords. Just before they died, they exchanged the Kiss of Peace, greeting each other with great love and serenity. They died praising God, and all were amazed at how happily they went to their martyr’s reward in Heaven. 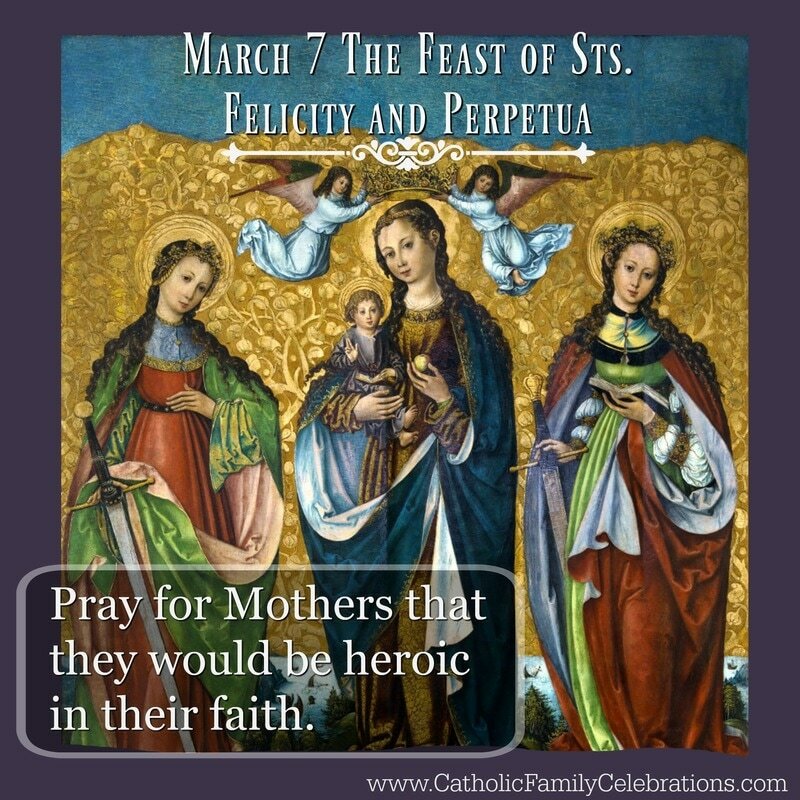 The Passion of the Holy Martyrs Perpetua and Felicity is an account of the death of these holy women, written in part by St. Perpetua herself. The two saints were buried together in the Basilica Majorum in Carthage.